Pontus Jansson, controversially banned after comments he made after the Brentford game. It is not quite in “must win” territory, but tonight’s home game with Ipswich Town has taken on an important air now for Leeds United. With memories still fresh in the mind of last season’s collapse after a bright start the Whites are in danger of slipping off the pace again following last Saturday’s 2-1 defeat to Blackburn Rovers. While in some ways they were unlucky to lose after dominating possession once again a defeat it was and it brought an end to the unbeaten away record under head coach Marcelo Bielsa. Leeds have now only won one of their last five Sky Bet Championship matches and only won twice in their last nine games in all competitions so any air of invincibility has obviously gone. Results-wise it is beginning a look a little like history repeating itself so there is an obvious need to quickly stamp out negative thoughts of a year ago and the only way to do that will be to string some victories together, beginning with the game against Ipswich at Elland Road and another home match against Nottingham Forest on Saturday. Tonight’s game offers United a big chance to begin to get their act together again, although another loss could set a few alarm bells ringing with Ipswich bottom of the table and only managing one victory in their 13 league games so far. They have drawn six so are no easy beats, however, and the Whites will have to find more of a cutting edge after only managing one goal in each of their last five matches despite dominating much of the play in all of those contests. The return from injury of Kemar Roofe did not instantly improve matters at Blackburn as he looked short of the match sharpness he began the season with. He was switched around between a central and a wide role and that did not help him before he was taken off. United did improve, however, when Pablo Hernandez made his return from injury as a second half substitute. 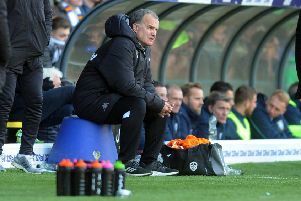 He was not played from the start as Bielsa thought he would not last a full 90 minutes, but his display would suggest he has to begin against Ipswich. Elsewhere in his team selection, Bielsa has decisions to make on who plays where in defence. Luke Ayling is available again after serving his one match suspension and favourite to go straight back in at right-back with Gaetano Berardi switching to a central defensive role with Pontus Jansson controversially banned for a game by the FA for comments made on the referee’s performance after the Brentford match - when all the Brentford culprits from the same game were let off scot free. With Barry Douglas expected to still be out injured the left-back role is up for grabs with youngster Tom Pearce competing with Stuart Dallas or maybe Ezgjan Alioski to start there. Winger Jack Harrison missed the Blackburn trip with a muscle injury, but Bielsa confirmed yesterday that he was back in training and in contention to make a quick return.